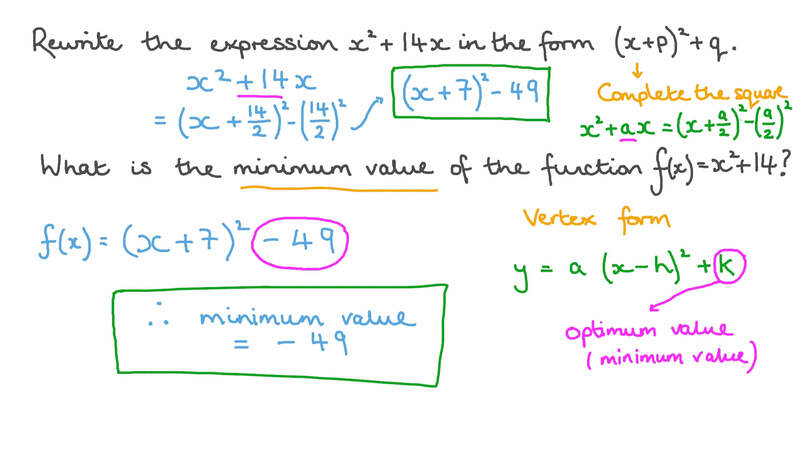 In this lesson, we will learn how to write a quadratic function in vertex form. Rewrite the expression 𝑥 + 1 4 𝑥 2 in the form ( 𝑥 + 𝑝 ) + 𝑞 2 . What is the minimum value of the function 𝑓 ( 𝑥 ) = 𝑥 + 1 4 𝑥 2 ? Find the vertex of the graph of 𝑦 = − 𝑥 2 . Find the vertex of the graph of 𝑦 = 5 ( 𝑥 + 1 ) + 6 2 . Which is the following is the same as the function 𝑓 ( 𝑥 ) = − 2 ( 𝑥 + 1 ) ( 𝑥 + 5 ) whose graph is shown? C The function does not exist. By writing 𝑓 ( 𝑥 ) = − 𝑥 + 8 𝑥 + 𝐴 2 in vertex form, find 𝐴 such that 𝑓 ( 𝑥 ) = 3 has exactly one solution. Consider the function 𝑓 ( 𝑥 ) = 𝑎 𝑥 + 𝑏 𝑥 + 𝑐 2 where 𝑎 ≠ 0 . What is the 𝑥 -coordinate of the vertex of its curve? Find the vertex of the graph of 𝑦 = ( 𝑥 − 3 ) + 2 2 . Rewrite the expression 4 𝑥 − 1 2 𝑥 + 1 3 2 in the form 𝑎 ( 𝑥 + 𝑝 ) + 𝑞 2 . What is the minimum value of the function 𝑓 ( 𝑥 ) = 4 𝑥 − 1 2 𝑥 + 1 3 2 ? Rewrite the expression 𝑥 − 1 2 𝑥 + 2 0  in the form ( 𝑥 + 𝑝 ) + 𝑞  . What is the minimum value of the function 𝑓 ( 𝑥 ) = 𝑥 − 1 2 𝑥 + 2 0  ? Rewrite the expression − 4 𝑥 − 8 𝑥 − 1 2 in the form 𝑎 ( 𝑥 + 𝑝 ) + 𝑞 2 . What is the maximum value of the function 𝑓 ( 𝑥 ) = − 4 𝑥 − 8 𝑥 − 1 2 ? In completing the square for quadratic function 𝑓 ( 𝑥 ) = 𝑥 + 1 4 𝑥 + 4 6 2 , you arrive at the expression ( 𝑥 − 𝑏 ) + 𝑐 2 . What is the value of 𝑏 ? Which of the following is the vertex form of the function 𝑓 ( 𝑥 ) = 2 𝑥 + 1 2 𝑥 + 1 1 2 ? Find the vertex of the graph of 𝑦 = 𝑥 + 7 2 . Find the vertex of the graph of 𝑦 = 𝑥 2 . If the area included between the curve of a quadratic function and a horizontal line segment joining any two points lying on it, as shown in the figure below, is calculated by the relation 𝑎 = 2 3 𝑙 𝑧 , find the area of the figure included between the 𝑥 -axis and the curve of the quadratic function 𝑓 ( 𝑥 ) = 𝑥 − 1 2 𝑥 + 3 2 2 in square units. Find the coordinates of the vertex of the curve 𝑓 ( 𝑥 ) = 8 − ( − 4 − 𝑥 ) 2 . In the figure below, the area included between the curve of the quadratic function 𝑓 ( 𝑥 ) = 𝑥 − 1 6 𝑥 + 5 5 2 and the line segment 𝑙 lying on the 𝑥 -axis is calculated by the relation 𝑎 = 2 3 𝑙 𝑧 . Represent the function 𝑔 ( 𝑥 ) = | 𝑥 − 8 | − 3 on the same lattice to find the area of the part included between the two functions in area units.